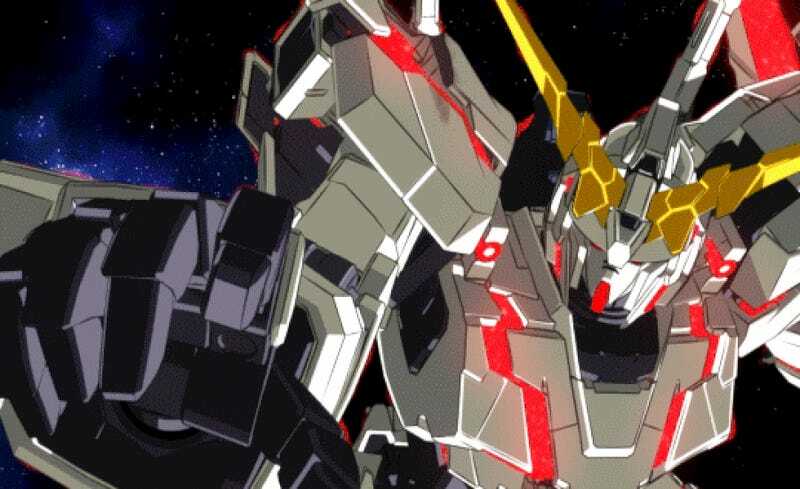 Welcome back to the Universal Century and Gundam Unicorn RE:0096 where after a lit bit of a slow start we’ve finally started to get to the meat of the series and the action. Also we’re finally introduced to the titular Unicorn Gundam. Now a little house cleaning I’ll be finishing up and publishing the Universal Century primer shortly I’ve promised which again will be designed to help explain some of the terms and meanings of the series. That being said lets just right into the action with Episode 3 “They Called it Gundam”. The episode picks right up following last weeks cliffhanger as the Neo-Zeon group the Sleeves invaded the Colony. Once inside Maridia and her Kshatriya engage in a Mobile Suit battle with the colony defenses. Despite her enhanced abilities and the raw power of the Kshatriya Marida is challenged for the first time in the series. She finally defeats her opponent but the cost too the colony of the battle is high as many innocent civilians are caught in the crossfire. As the Kshatriya’s Funnels continue to inflict damage upon the colony and it’s citizenry the school children look in horror as it becomes apparent war is on the horizon. Banagher who seemingly off screen rejoined his classmate (another odd editing cut) runs off as he realizes his new friend Audrey is almost certainly in danger. Back at the Snail the Sleeves crew has left Cardeas and his adviser/bodyguard likely to escape the danger their allies pose. Cardeas sensing the situation has gone awry makes haste towards the command module and the Unicorn. As the battle rages on Cardeas comes face to face with yet more guns this time held by a man he seemingly trusted, Alberto. Back with Banager now also in the snail he comes face to face with the escaping Sleeve commanders. About to be shot the Sleeve captain saves him and spares his life, showing a certain morality in the fact he wont at least kill children. Cardeas however doesn’t fare quite as well as his erstwhile son as he attempts to escape he finds himself with lead in the stomach as Alberto shoots him. Outside the snail and near the action a couple of Banaghers friends meet up with Audrey who one recognizes from the time she spied them from afar last episode. 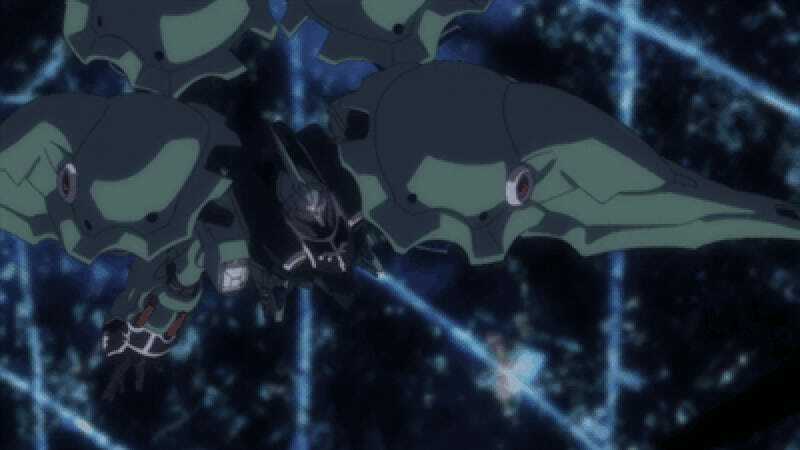 However the area remains hot with danger as the Kshatriya’s funnels continue to inflict mass damage among the colony’s defenses and the colony itself. Lucky the students are saved by a near by Earth Federation Mobile Suit. Somehow as if by providence Banagher manages to find his way to the Unicorn after sensing the Audrey was okay. Not knowing what he’s stumbled across he finds Cardeas Vist tinkering with the machine. Both men, father and son are surprised to see each other. After a few cryptic words from Vist implying he knows both Audrey and Banagher, the young man breaks down. Blaming Cardeas for the war raging around them and his failure to stop it. How it was his fault all these people with “plans for tomorrow and next week” are now dead. How their blood is on his hand. Cardeas looks at him quietly however the old man doesn’t bow to the naive idealism of Banagher. Explaining as humanity expanded beyond the Earth it grew out of control and lost it’s dignity. As Cardeas speaks Banagher knows the words and speaks of humanities potential - the potential of Newtypes. 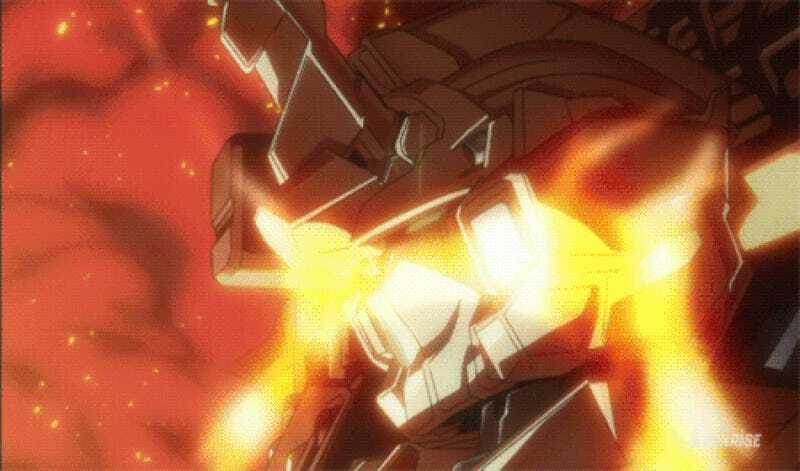 As he takes Cardeas hand Banagher is asked does he have the resolve to aid and stand by Audrey along her path. Banagher replies no only he must be with her. Accepting that as a suitable answer Cardeas bequeaths literally as he dies the Unicorn Gundam. However before he passes on he explains to his son the truth of their family and says one final good bye. As the epic music swells up in the first (of many) truly epic scenes in the series the Unicorn powers up for the first time. Sensing an incoming threat Maridia preemptively deploys her Kshatriya’s funnels. 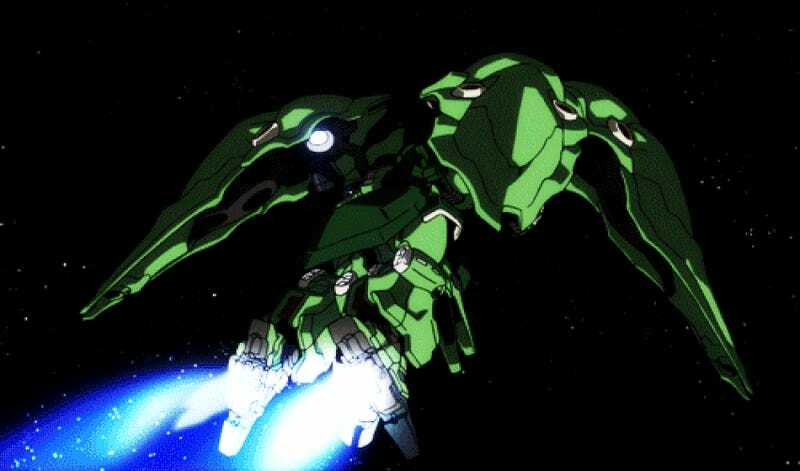 However the Unicorn proves too powerful and quite literally pushes the Kshatriya out of the colony into open space. However she rallies and launches a second attack. 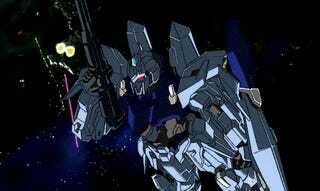 This causes Banaghers latent Newtype abilities to awaken, awakening the Unicorns psycoframe a technology last seen during Char’s Rebellion as shown in Char’s Counterattack. Announcing to all around a new Gundam has awoken during this time. This revelation causes Maridia to become enraged. However the Kshatriya is no match for the Unicorn and is forced to retreat. Following the battle the Unicorn is hailed and picked up by the same Earth Federation ship that rescued Audrey. Abored the Sleeves mothership the crews higher ups among the Neo-Zeon forces are outraged at their failure to both defeat the mysterious suit and secure Laplaces Box. 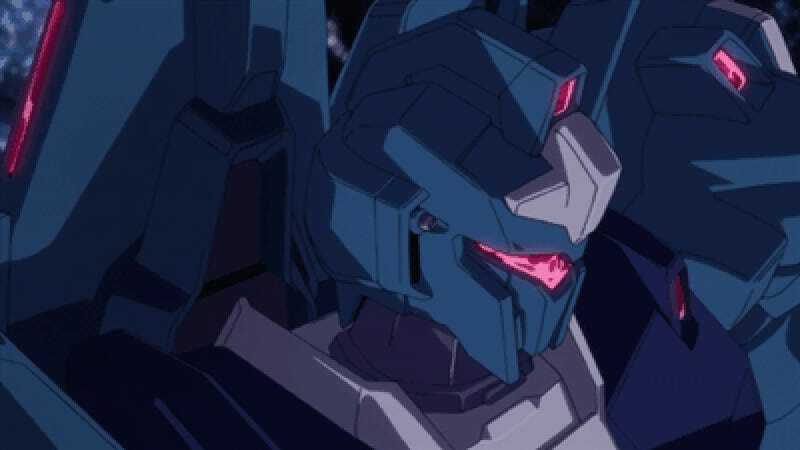 However their commander a mysterious masked man seems more intrigued by the news of a new Gundam being active. Again the episode had some issues mostly associated with its transition from OVA to Anime. However on a whole it remains a much more enjoyable episode as the vast majority was action. In many ways these first three episodes serve as little more then the set up for the series which many explain their confusing nature. Moving on I can assure you readers we’re going to have a much more fun time as the action and intrigue picks up. However if you’re lost on anything so far I encourage you to please ask me for clarification treat me as a resource to help you guys out.